Do you want to monetize your blog or Make money blogging? Every single person in this world tries to make money online. When it comes to making money online people complains about that they worked for fraud sites. This is where people ask me that they want to find out the best ways to make money online. Blogging is the best way to make money online. Every day thousands of people start a new blog thinking to make more money online. People try everything to monetize their blogs, yet most of the times they are not able to earn anything and give up blogging after some time. Do you know that it takes times to a site or blog actually start generating revenue? There is always a lot to do before you can start expecting your blog to generate money for you. To make money blogging, you need to understand the nature of your blog and find the suitable ways to monetize your blog. To make money as a professional blogger or A-list blogger, you need to find the best ways to monetize your blog content. Right now, there are thousands of ways available online that help you to easily monetize your blog or website. Options are so many that you may get confused about what to choose and what to ignore. Today I have decided to help you with the list of best ways to monetize your blog. The ways I am going to share today will help you to effectively monetize your blog and make money blogging like professional bloggers. Here are the ways that will help you to earn money online with your blog. As the name suggests, this method is for you if you want to make money blogging by monetizing your blog with PPC ads. PPC ads are pay per click ads, means when a reader or visitor click on the ad you will earn money. To make money with pay per click advertisement, you need to register yourself on the ad provider site for approval. If the ad provider approves your blog then you can place ad code on your blog to display ads. PPC ads are also known as contextual ads, means it changes according to the content of the site. It shows only relevant ads according to your blog content. Google Adsense is the best network to display pay per click ads on your blog. But they are not the only business in this industry. Earning from pay per click ads varies. It depends on many factors such as your blog content, popularity, traffic, engagement, user behavior etc. When monetizing your blog with pay per click ads you should also keep in mind that very small percentage of visitors click on these ads. So to earn good money your blog needs to get a good amount of traffic on regular basis. To make more money with Adsense or any other ad network, you also need to focus on CTR (Click through rate). You can take help of Adsense heatmaps to understand what are the most valuable parts of your blog or most visible parts of your blog and place ads there. Most of the times, the ad below post title, ad in sidebar and ad at the end of the post are known as the most visible parts of a blog. When monetizing your blog with pay per click ads, you should also focus on CPC (cost per click). This helps you determine that how much money your blog will earn for you from a certain type of ad. Usually, the ads related to loan and mortgage generates more revenue than a smartphone ad. To make more money with PPC ads you also need to understand that your earning also depends upon the content of your blog. If you are running a financial blog that means the visitor will see financial ads and you will earn more. You can easily monetize your blog with PPC ads. But to make good money your blog needs a lot of traffic. If you understand PPC then you can easily understand CPM (cost per mile advertising). CPM is not based on pay per click but it is based on cost per thousand miles. That means you will get paid for the number of impressions ad on your blog receives. This is calculated based on per 1000 impressions. For example; if CPM is $1 and the ad is getting 100k page views per month, then you will earn $100/month. There are so many CPM ad networks available online. It is easy to get approval from most of the Cost per mile ad networks. You can easily monetize your blog with CPM ads. You will see many newbie ad providers and some established CPM ad networks. The popular network usually pays you more. The reason is that popular CPM networks provide better and high paying ads. Your earning also depends upon what type of ads coming on your blog. For high paying ads, you will earn good money. Too many goods with CPM you need the huge amount of traffic regularly on your blog. CPA ads are also a good way to monetize your blog or website. You can easily apply for various CPA ad networks. In CPA ads, you will earn money when the visitor completes an action. For example; if you run a CPA ad to install an app, then if a visitor installs that app, you will earn money. CPA ads are effective for those who have a large customer base and show niche related ads. Text link ads are becoming very effective to make money online. Text link ads link more natural and people are more likely to click them. It is easy to place text link ads between your posts and it looks beneficial for the visitor. Native ads are the ht trend of blogging industry. Not only blog but news website are also monetizing their websites using native ads. Native ads display at the end of the article as recommended content. Once a visitor clicks on such as and visit the ad page, you will earn money. Native ads are very effective to monetize your blog if you have a good number of regular traffic. In-text ads also look like text link ads. The difference is that in-text ads are the ads placed on the words on your already existing content. When a reader moves a mouse over that text it will show the ad. It is easy to sign up for an in-text advertising network and place in-text ads on your blog or website to make money blogging. Many small sites and blogs monetize their content with in-text ads. Infolinks is a great example of an in-text ad network. It is a good way to monetize your blog to make money blogging. There are many advertising networks that allow you to monetize your blog using advertising widgets. Webmasters are more willing to use advertising widgets on their blogs to boost blogging income. The best thing about advertising widget is that it can be placed easily on any website and mix of various ad programs. Advertising space is also a great way to monetize your blog or website. You can make money effectively by selling ad space on your blog. You can sell banner ad space. The best thing is that you need not pay to any third party to get your advertising clients. You can display advertising space on your blog with the price you want to charge from the advertiser. If you blog is good and advertiser finds it good fit then you can easily make money for monthly advertising. If you are running a blog then RSS feed is a must have the thing. If you have RSS feed then you can advertise your RSS feed to monetize your blog content. RSS feed monetization is an old strategy and still, many bloggers utilize that. All you need is to connect your RSS feed with advertising company or network. You can use Bidvertiser to monetize your RSS feed. Have you ever thought about monetizing your audios or podcasts? You can easily monetize your audio with pay per play audio ads. These ads will play before or between the audio and visitor has to listen to the ad before listening further. If you count unique visitors then you will find 100% conversion rate. But the same time it can offend your visitors as they have to listen to the audio advertisement. You can also use podcast ads to monetize your podcasts. You can include audio advertisement in your weekly podcasts. This will help you better monetize your blog. You may have seen popups on my blogs or websites. Most of the times, popup ads are asking for email or showing ads. Popup ads are very common. They seem annoying as they disturb the user from accessing the content. If you want to monetize your blog with popups then you should make it appear only to a new visitor. These will easily grab attention and help you earn more. If you want to make money blogging with popups then make sure that do not annoy your readers. Affiliate marketing is a great way to make money online. But it is effective for those only who understand how to make money with affiliate marketing. You can use various ways to make money with affiliate marketing. Reviewing a product and making your readers aware of the product is the best way to make money online with affiliate marketing. This is the best way to monetize your blog or website. You can get paid for each sale that you generate. You can easily earn 10%-40% commission by selling various products or services on your blog. When monetizing your blog with Affiliate marketing you fill find two type of affiliate programs. Do you know that you can even make money by reviewing products of various clients on your blog? It looks similar to affiliate marketing but it is different. In affiliate marketing, you are reviewing the products you want to promote. But when you work for a client then you are reviewing this product. If you want to monetize your blog with sponsored reviews then you should focus on products related to your own blog niche. For example; if you are running a technology blog then you should not review a health product on that. You can even start a blog on review niche where you can review various products and cover multi-niche reviews on your blog. Businesses are running because of consumers. That means if you want to run a business then you must have some service or products to sell. If you are a developer or programmer then you can create software to help people and start selling those products. You can either create an independent website to sell software or you can also sell through your own blog. Once your product gets popular you will earn good money. EBooks writing is a common thing these days. Every professional is writing an ebook to boost you should also try it. As a blogger, you already are writing a lot of content for your readers. It is good to take benefit of ebook writing and write ebooks for Kindle and eReaders. I advise you to write an ebook related to your own blog niche and start selling on your own blog. It is an effective way to monetize your blog. You can start selling ebooks on Amazon also. When your ebook gets really popular then you can become a good handbook writer. You can easily start getting offers from printing press and publisher houses. You can even start selling a hardback book on your blog also. But you can only monetize your blog in this way if you are popular and have a good number of followers. If you are professional and influencer in your niche then you should create a tutorial for your readers. Your tutorials will be helpful for those who want to learn from you. For example, if a person wants to learn how to make money blogging or how to monetize his blog then he should consider this guide. Your tutorials and guides will help you to attract huge traffic o regular basis and establish you as an influence. You can also sell your tutorials on your blog. You can start running online courses. You can teach people how to clean their code and make site effective. You can also teach how webmasters can boost the speed of the website. For example; when I want to learn to blog I spent $300 for a professional blogging course to learn from Gaurav Kumar, founder of easkme. It has helped me a lot and now I am earning more than that. It is a great idea to start a course and sell that. If you want to create an online course then you should first find out what your readers or visitors looking on your blog, what they want from you and what should you offer them? To find the answer to these entire questions you should run live workshops or seminars. This will help you interact with regular readers and find out what they expect more from you. You can also record online workshops and share them on your blog. People usually find these online seminars helpful and they are more willing to interact with professionals. You can also promote the product and service you are offering in these workshops. This will help you to educate people about your products and surely will help to boost sale. Webinars are the best way to run a live online workshop. These days’ webinars are a really popular way to connect with readers and spread the word about new or old issues. You can charge money for the people who want to be the host or give a presentation in your webinar. You can even run paid webinars. To make the webinar effective you should use polls, photos, webcam, microphone, presentations etc. Make you webinar interactive. You can allow others to ask questions and answer those questions until the end of the webinar. You can also use webinars as a marketing strategy. Becoming a consultant is also a good way to monetize your blog. But to make money with consultant services and need to have a good number of readership and you need to be an influence in your industry. You can start one-one coaching programs. People are likely to pay a professional for their services. For example; If you are running a science blog then you can launch a program where you will be teaching students about latest science experiments or share knowledge that can help them. You can charge $100/hour for your session. To make money this way, you must have a good reputation. If you are a professional blogger who is organizing events on regular basis then you can find sponsors for your events. You can organize events such as workshops, webinars, podcasts etc. You can find sponsors for your event and promote them in the beginning or at the end of your event. This will help you monetize your blog with various options. You not only get traffic and can offer special deals but you will also build a reliable audience. People start a website or blog to make money selling services. If you are a professional in your niche then you can start selling your services. For example; if you running a law blog and you are a lawyer then you can start selling law advice services on your blog. You can even create a website where you mention your services and start promoting them. Interested visitors will pay you for your services through your blog or website. You should create a hire me page so that people will know how you can help them. There are a lot of websites that make money by offering a premium membership. Many newspapers are switching from paper to online news website to attract more readers. Usually, people visit to read free content but if they find the premium plan offering more benefits, they will surely buy a premium membership. Private forums are also similar to premium membership sites. In a private membership forum, members will pay a fee to interact with the influencers. You should also understand that there are tons of free forums are available. To make people join your private forum, you need to provide the content which is not available anywhere online and also which is more valuable for the members. Email marketing helps you to make good money. There are many benefits to email marketing. You get loyal readers, you get regular traffic and you make money. To make money with email marketing, you should focus on building a large email list of subscribers. When visitors sign up using email subscription form, they start getting regular updates from your blog. With a huge email list, you can easily grab good traffic on regular basis. You can turn your blog into a brand. You can easily promote products, services and events. Email marketing is not the direct way to monetize your blog but it has many benefits that make it a must-have thing. When using email marketing service also focus on that you do not overdo it or else your email will end up in the spam folder. You can monetize your blog with surveys and polls also. There are companies that will pay you for publishing surveys on your blog. All you need is to find the suitable survey according to your niche and publish that on your blog. You will get paid on CPM basis. Paid directory listing is a good way to monetize your blog. In this, you will spare a space on your blog for listing links to various businesses or services. For example; if you running a health blog then you can start a separate page to list manufacturers of health products. You can charge them for displaying their links. Job boards also a good way to monetize your blog. You can create a separate page on your blog where companies or businesses can list their vacancies. For a minimal fee, you can allow businesses to list jobs and find a suitable candidate. It is a good way if you have a good number of readership and large subscriber base. If you are a web designer and developer, then you can easily design WordPress themes. You can sell your beautifully designed and fully optimized WordPress theme on your blog. Thousands of new website launch every year. Your theme can easily sell online. You need to design fully optimized theme with latest design trends. You can easily sell a theme between $20-$100. The price of the theme depends upon your quality and popularity of the theme. This blog theme is purchased from Studiopress. You can sell your themes on theme marketplaces such as Template monster and ThemeForest. Donations are also a good way to monetize your blog. They are an alternate source of earning. You can easily setup a donation button using PayPal and publish that on your blog. This way you can ask people to help you pay expenses for the website. Donations work for big sites with a large number of regular readers. This method can also work on your blog if it is offering helpful information. Selling your blog or website is also a good way to make money blogging. If you are not able to run your blog and you believe that someone else can make it work in a better way then you should consider selling it. There is a website like Flippa.com, where you can add your site for sale. It is always good to buy a running website rather than setting a website from the beginning. With a running website, you will get quality traffic and email subscribers as well. 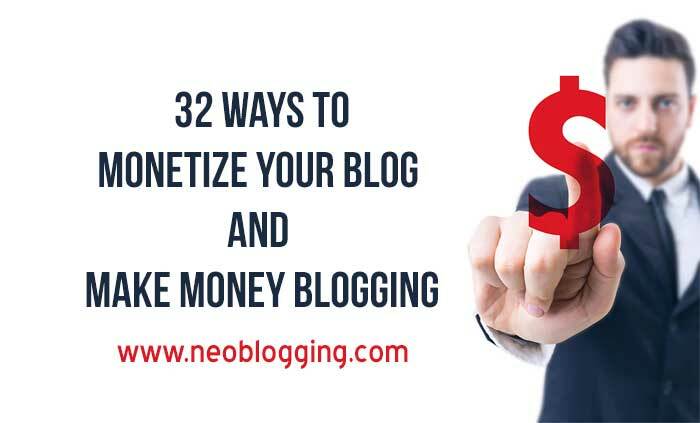 These are the 31 ways that you can use to monetize your website or blog. Have you ever used any of these methods? How many methods do you use to monetize your blog? Do you know any other way that I have not listed here? If you still have a question, feel free to ask via comments.